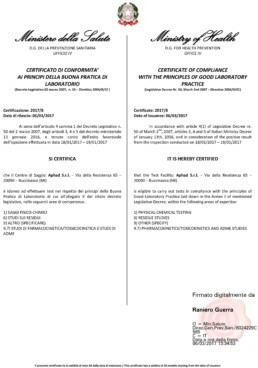 APhaD is qualified by the Regional Authority ASL Milano 1 to perform Pharmacokinetic, Metabolism and Bioequivalence bioanalyses for clinical trials (GCP) according to art 1 and 2 of D.M. 19 March 1998. AIFA (Italian Medicines Agency) has recorded Aphad in the OsSC. 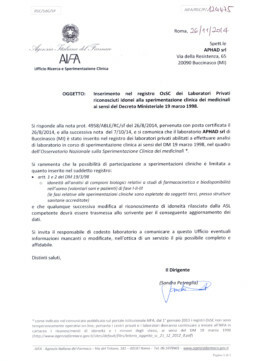 APhaD was successfully inspected by the Italian Ministry of Health for preclinical GLP bioanalyses and veterinary studies on residuals. APhaD is eligible to carry out tests in compliance with GLP for 1) Physical-chemical testing, 6) Residues studies and 9.7) Pharmacokinetics/toxicokinetics and ADME studies.